The last few years have been exciting for the mattress industry. A host of new companies have launched, stepping up to the plate to battle the traditional mattress giants. In today’s comparison review we’ll be look at one of those new challengers, Leesa.. It’s Leesa vs. Tempurpedic. Can Leesa’s new breed of streamlined manufacturing, delivery, and sales take down Tempurpedic? Continue reading for our full Leesa vs. Tempurpedic review. In a bit of a rush? Click here to skip to the review summary for the quick version. The Leesa is a hybrid foam mattress. 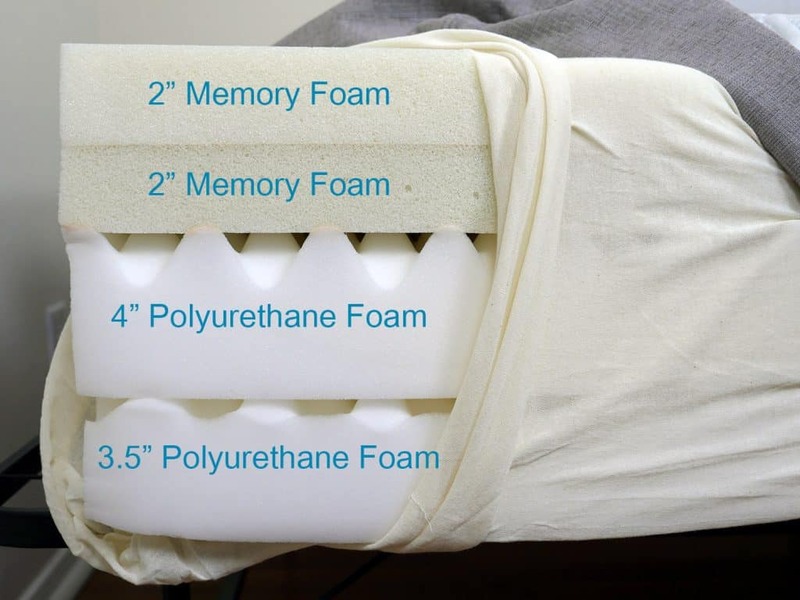 Hybrid mattresses are designed with varying layers of foam (or other materials). By using different layers in varying thickness and positions you can achieve the optimal comfort, support, and cooling desired. The Leesa is constructed from 3 different layers of foam. Top Layer (comfort) – this layer is constructed from 2.0″ of Avena foam. Avena is a latex foam alternative. As such, it reacts very similar to latex. It has great bounce, comfort, and good cooling. However, it’s more durable than traditional latex foam. Middle Layer (support) – this layer is constructed from 2.0″ of memory foam. Memory foam provides exceptional support, pressure relief, and deep compression stability for the mattress. 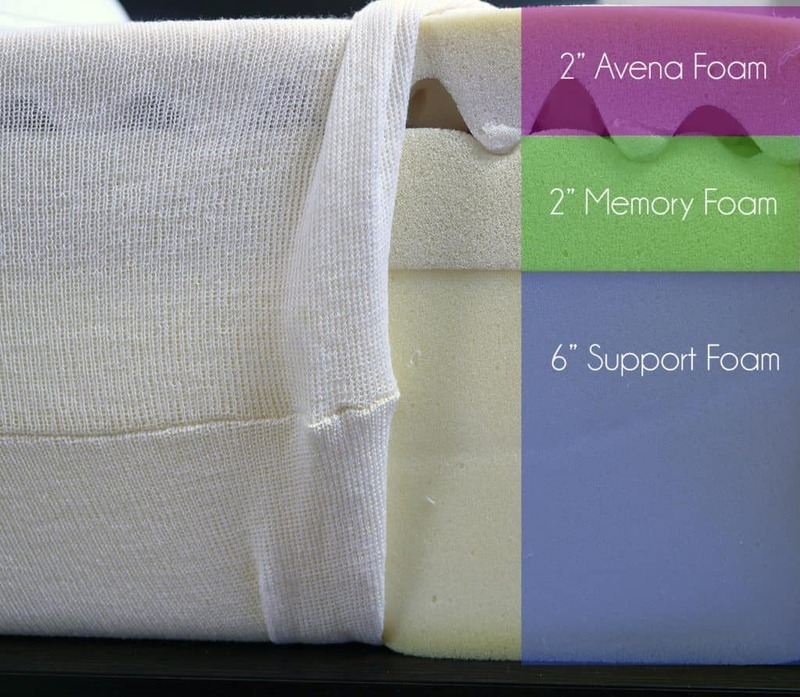 It is intentionally placed below the Avena foam layer in order to help keep the mattress cool (since memory foam as a top layer can result in a mattress that sleeps warm). Bottom Layer (foundational) – this layer is constructed from 6.0″ of high density support foam. This foam acts as a foundation for the mattress and supports the above layers. It is a highly breathable foam, helping to dissipate heat from the mattress. The cover of the Leesa uses a unique 4 bar design. The cover itself is extremely well made. It is woven from a single piece of fabric and almost 100% seamless. The only seams on the cover are those needed to make the sharp corners. The cover is fairly thick, smooth, and has a nice softness to it. The cover, like everything in the Leesa mattress, is made and sourced 100% in the USA. The Leesa has a neutral firmness at a 6 out of 10 on the firmness scale (where 10 is the most firm). The firmness and feel have been designed to be suitable for the vast majority of sleepers. ~85% of sleepers prefer a mattress in the neutral range of firmness. When you initially lie down on the Leesa mattress you’ll feel an immediate softness from the cover and layer of Avena foam. After a moment you’ll begin to sink a bit into the mattress. In a normal lying position there is 1-1.5″ of sinkage into the Leesa (note: I am 140 pounds, your sinkage will be relative). One of the best attributes of the Leesa is the responsiveness. It quickly adjusts to your movement and body changes during the night. One of the most impressive attributes about the Leesa is it’s ability to support sleepers in almost every position. As a stomach sleeper, I never once felt as if the mattress struggled to support me. The foams worked to maintain a consistent spinal alignment and provided a nice level of push back to prevent me from sinking too deeply into the foams. Similarly enough, my side and back felt just as well supported. Granted, I am not the heaviest of sleepers, but the ability of this mattress to easily and quickly adjust to my sleeping position leads me to believe that Sleepers of varying weights will certainly be able to find a comfortable position on this mattress. Leesa states that their mattress is able to support individual sleepers up to 300 pounds and couples up to 600. Therefore, this mattress should not be overlooked by the heavier sleeper who’s looking for quick response, excellent support, good pressure relief, above average cooling, and most importantly, a great value. In terms of cooling, the Leesa also does a good job. As I mentioned above, memory foam has a tendency to absorb heat and get warm during the night. However, by placing their memory foam layer below 2 inches of Avena foam, it does an excellent job of keeping the surface level of the mattress cool. The Avena foam is also aerated, allowing for improved airflow in and out of the mattress. Bounce was another characteristic about the Leesa that really caught my eye. Even with an all foam construction, this mattress was able to provide a nice degree of bounce. The Avena foam plays a large role in this area as well. As a latex alternative, Avena is able to quickly respond to sharp amounts of pressure, almost instantaneously. This small addition makes amorous activities much more enjoyable. In addition, it serves as an aid for those sleepers who struggle to get out of bed. The Leesa’s bounce and response makes it much easier to roll over, sit up, and get your day started. Just as a comparison point, the Leesa can be considered a combination of the Tempurpedic Cloud Supreme Breeze, the Cloud Prima, and the Flex Supreme. This is due mainly in part to Leesa’s ability to respond quickly to pressure and support a vast majority of sleepers all while providing a comfortable sleeping experience. The main difference, the price of the Leesa is dramatically less than each one of these Tempurpedic models. Returns – very easy, 100% money back guarantee if it isn’t the right mattress for you. The Tempurpedic Cloud Supreme Breeze mattress is an 11.5″ all foam mattress constructed from 4 different layers. Top layer (comfort) – 2″ of visco elastic memory foam. This top layer provides the soft feel for the sleeper upon initial contact with the mattress in addition to the sharp contour and hug the Tempurpedic line of mattresses are known for. Second layer (comfort & support) – 2″ of visco elastic memory foam. With a slightly firmer feel than the top layer, this layer works to provide support in addition to the comfort for the sleeper. The firmer feel also aids in providing a smooth transition from the top foams into the bottom layers. Third layer (support) – 4″ of polyurethane foam. The third layer acts primarily as the transitional layer between the above comfort layers and bottom foundational layers. Bottom layer (support & foundation) – 3.5″ of polyurethane foam. 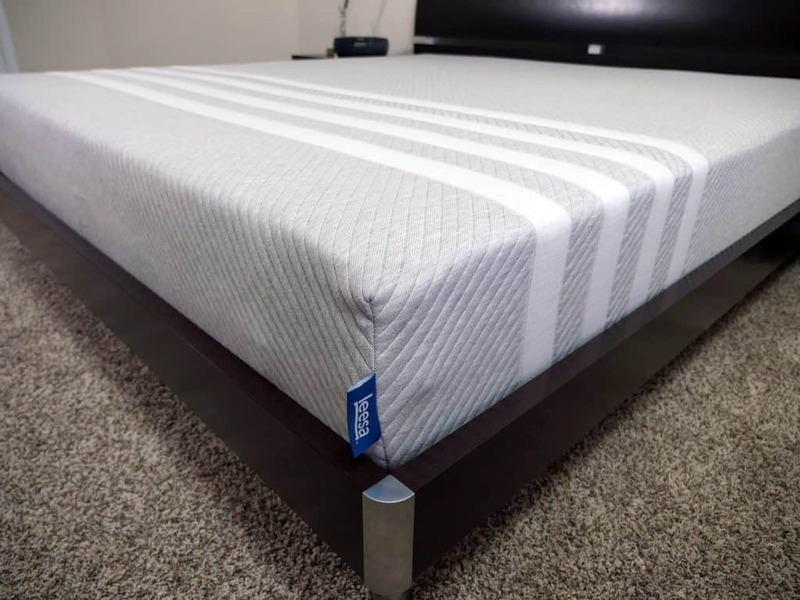 With a dense composure, the bottom layer of foam acts as the deep compression support for the sleeper in addition to the base for the mattress as a whole. 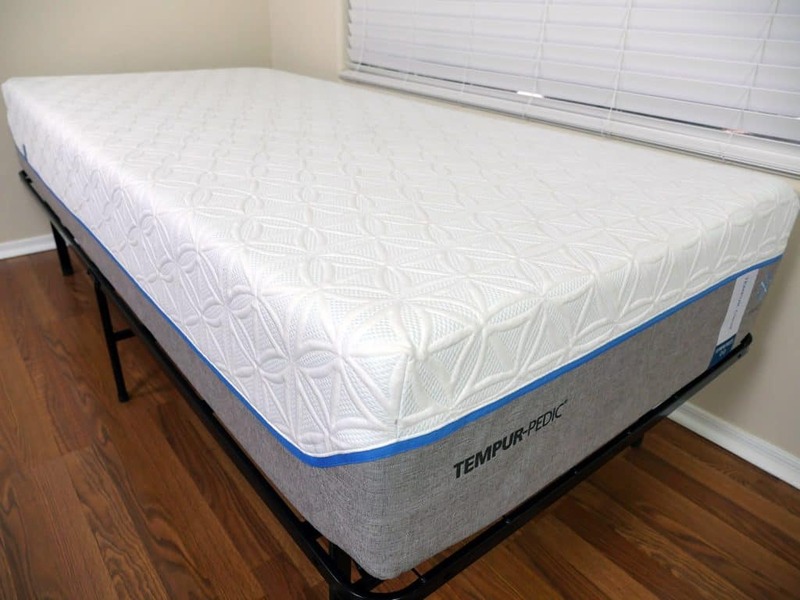 The Tempurpedic Cloud Supreme Breeze has a very well made and nicely designed cover. Made from polyester (94%) and spandex (6%), the cover has a classic texture, nice softness, and seems to be very well made. Tempurpedic uses a two-tone grey / white color scheme to add contrast, along with a pop of blue, which really helps the design come to life. This top piece is a constructed from a Tempurpedic’s Breeze material. This material actually works to regulate body temperatures by cooling you down when you get warm and warming you up when you get cold. In addition, the cover is thin, by design, which aids in airflow in and out of the mattress as well. Lastly, the top white piece of the cover can be completely unzipped and removed. Note the zipper that runs halfway up the side of the mattress on the perimeter. This allows you to easily detach the cover for cleaning, although only spot cleaning is recommended. The Tempurpedic Cloud Supreme Breeze mattress comes in at 5 out of 10 on the firmness scale (where 10 is the most firm). The Tempurpedic has a fair degree of sinakge. Initially I lied down and sank in about 2″ into the mattress. However, after about another 15-30 seconds, I had sunk in about another inch, bringing me closer to 3″ of sinkage (on my back). This level of sinkage may not be for everyone, so you’ll want to be sure you’re a fan of the more traditional, deeper level of sinkage that comes with this mattress. Although sinkage was a little deeper than I typically prefer, I will say that the Cloud Supreme Breeze did a nice job of maintaining a balanced feel overall. The lighter areas of my body may not have sank in as much as the heavier limbs, but there was definitely a nice degree of sinkage that allowed for a more consistent feel all together. This is one of the main reasons why the Tempurpedic mattresses are known for their pressure relief as well. Unlike the Leesa, the Cloud Supreme Breeze felt a tad too soft while sleeping on my stomach. Even though the lighter areas of my body were still sinking in, the level of sinkage around my hips created somewhat of an awkward angle along the lower part of my spine, making for an uncomfortable sleeping experience. As I rolled over onto my side, it was a completely different story. I felt very well supported and had no issues with spinal alignment. Finally, my back was closer to the comfort level I experienced while on my side, but I would say it was slightly less than ideal for me, personally. Once again, the sinkage was just a ouch too much. While sleeping on the Tempurpedic Cloud Supreme Breeze I did not feel as if it slept warm whatsoever. As mentioned before, the cover of this mattress does contain the TEMPUR-Breeze material, which works to regulate your body temperature throughout sleep. As a lighter sleeper, I would say the mattress did a pretty good keeping me comfortable (in terms of cooling). The only issue I have with this material, heavier sleepers are going to sink deeper into the mattress, which can lead to a hugging of the foams and a warmer sleeping environment. This may not be the case for all sleepers, but something to keep in mind. Lastly, bounce and motion transfer. As expected, the bounce of this mattress was virtually nonexistent due to the memory foam construction, but the lack of bounce did reduce motion transfer. My wife and I did not feel each other move once throughout the night. Should you buy the Leesa or Tempurpedic mattress? Both the Leesa mattress and Tempurpedic Cloud Supreme Breeze are high quality, well made, and all around great mattresses. 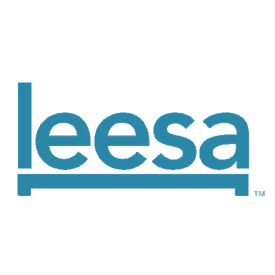 Leesa is among a small group of online mattress companies that are truly breaking new ground in the mattress industry. They have completely changed the way people think about and shop for a new mattress…they’ve also helped change the price point at which a quality mattress can be found. All things considered, I really like both of these mattress. If we exclude price as a factor and simply look at overall performance I would say they are very similar. Both utilize 4″ of comfort materials, both utilize quality foams, both utilize a convoluted foam layer for added breathability, and both are built by reputable companies. The only major material difference is Tempurpedic’s phase change cover, which helps the all memory foam construction keep temperatures in check. However, there can only be one winner. Looking at all factors I believe the Leesa to be the better choice. Want clarity in construction and materials – first and foremost, I love that Leesa is transparent and honest about what their mattress is constructed from. They have clearly detailed the exact materials, thicknesses, densities, and other specs used in construction. Tempurpedic is not as clear or transparent as to the material construction. As a result, it makes it very difficult to make a truly informed decision when considering Tempurpedic. Want a balanced and medium feel – while I like the feel on both of these mattresses, I think the Leesa’s feel is just a little bit better in terms of being liked by the majority of sleepers. It has a very balanced feel in almost every area…slight hug, nice even sinkage, great support, good body contouring, and medium firmness. If you like a deeper sinkage, you may prefer the Tempurpedic, but for most sleepers the Leesa is going to be the better option, in my opinion. Want a better value – when it comes to price the Leesa simply crushes the Tempurpedic. The Leesa’s Queen size is $2,659 cheaper than Tempurpedic’s Cloud Supreme Breeze and the King is $3,359 cheaper. I cannot come up with a compelling reason as to why Tempurpedic would be worth $2,600+ more than Leesa. Want an easier trial period & refund policy – Leesa has a 100 day trial and an amazing refund policy. If you don’t like the Leesa they will refund 100% of your money and help you find a place to donate or recycle the mattress. 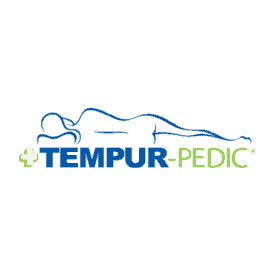 Many Tempurpedic retailers don’t offer a great return / refund policy, however, if you purchase from Tempurpedic.com you’ll have a 90 night trial and a refund policy more similar to Leesa. If you’re still on the fence I would recommend you give the Leesa a try anyway. Worst case scenario…you order the Leesa, try it for 100 days, decide you don’t like it, get a refund, and then make the switch to Tempurpedic or another mattress brand. Best case scenario? You just found an amazing mattress that you love and saved yourself $2,600+. Check out our complete Leesa mattress review. Want a medium feel – the Cloud Supreme Breeze strikes a perfect 5 out of 10 on the firmness scale, where 10 is the most firm. 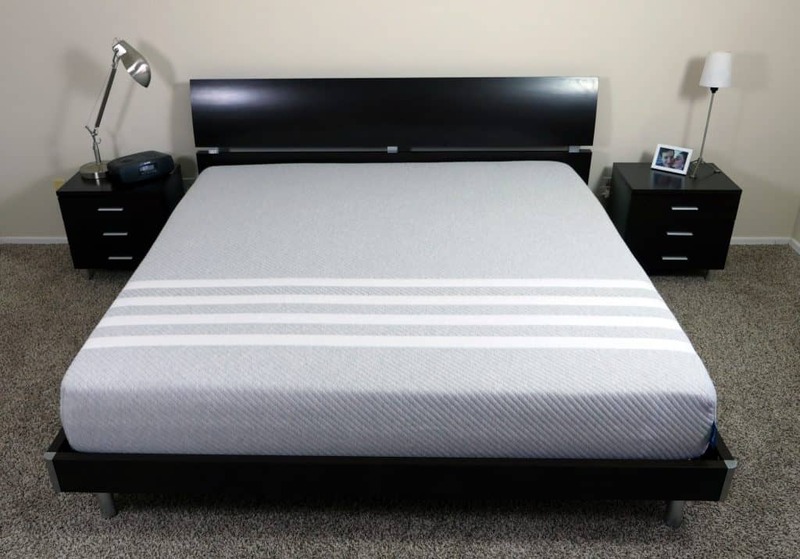 Want a memory foam mattress – the foams used in this mattress make for slower response times, deeper levels of sinkage and hug, minimal bounce, and almost no motion transfer. Want a pronounced hug and contour – once again, the memory foam construction is designed to allow sleepers to sink deeper into the mattress. As this occurs, the foams will contour to shape of your body. Tempurpedic’s memory foam has a slower response, so this can leave some sleepers feeling overly enveloped or stuck. If you’re not sure if you’ll like that feel I highly suggest trying it in-store first. You’ll want to be sure you’re a fan of the deeper sinkage and hug if you’re seriously considering the Cloud Supreme Breeze mattress (or most high density memory foam mattresses, for that matter). Have no objection to spending more money – in my opinion, I do not believe the mattress is worth an extra $2,600+ over the Leesa. Yet if money is of no concern, the Tempurpedic is still an exceptional mattress by any standard. 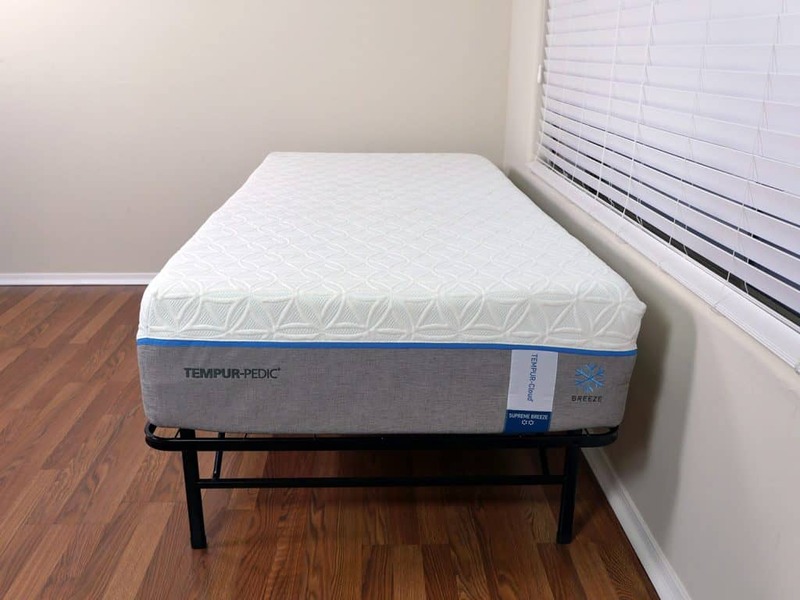 Check out our complete Tempurpedic mattress review.